Palmira in Bonita Springs, Florida is an active lifestyle community with resort-style amenities in a beautiful setting. Comprised of 13 unique neighborhoods, homebuyers can choose between single-family homes and coach homes available on a resale-only basis. Located just 40 miles from Fort Myers, the surrounding area offers endless opportunities for shopping, dining, and entertainment. This gated community offers the best in active lifestyle living. The main clubhouse at Palmira is called the Renaissance Center Club. Inside the 41,000 square-foot clubhouse, residents can stay in shape at the state-of-the-art fitness center, take a fitness class in the aerobics studio or socialize with neighbors in the billiards or card rooms. Afterwards, they can grab a bite to eat at one of the restaurants, dine at the private dining room, or catch up with friends at the bar. Outside of the clubhouse residents can bask in the sun around the resort-style pool or exercise in the lap pool. The seven lighted tennis courts and two bocce ball courts are popular among residents who enjoy a little competition. Residents of Palmira have the opportunity to become members of the Palmira Golf Club. This private club offers golf or social memberships for an annual fee. Members of the golf club have access to the 36,000 square-foot clubhouse as well as the 27 holes of championship golf designed by Gordon Lewis. There is also a practice facility featuring an aqua driving range, two practice putting greens, and a chipping area. Competitive play is also available with club leagues for all skill levels. Palmira is made up of 13 neighborhoods offering attached coach homes and single-family homes available on a resale-only basis. The coach homes are arranged in two-level buildings with four units per building. Most homes offer two to three bedrooms, two to two-and-a-half bathrooms, and an attached two-car garage. Enclosed porches offer a place to read the paper or entertain guests. All coach home neighborhoods have private community pools and a small clubhouse. The single-family homes range from smaller villas to larger estate homes. All single-family homes offer at least two bedrooms, one to three bathrooms, and an attached two-car garage. Most have beautiful golf course views and private in-ground pools enclosed with a lanai. Residents of Palmira enjoy an active and social lifestyle. Finding a club to fit your interests is easy with so many offered in the community. Golf and tennis players can join one of the many leagues in the community and compete with other players of the same skill level. Palmira strives to provide a lifestyle to fit those who are both physically and socially minded. 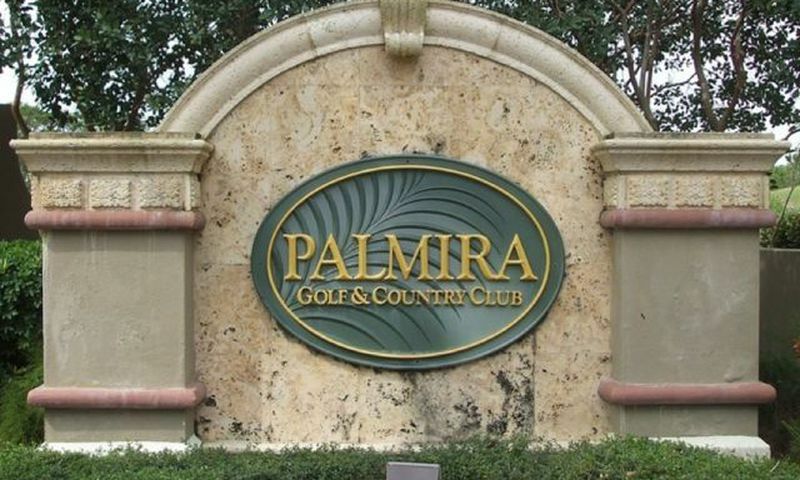 Palmira is located in beautiful Bonita Springs, Florida. Close to the Gulf of Mexico, this area offers white sand beaches and endless opportunities for entertainment. The community's close proximity to I-75 offers easy travel to the rest of Florida. Fort Myers is less than 40 miles north of Palmira and is a great option for a day trip. The numerous wildlife preserves in the area offers photographers and nature lovers a place to enjoy the scenic beauty of Southwestern Florida. With so much going on in the area it's easy to see why homebuyers are drawn to Palmira in Lee County. Renaissance Center Club - 41,000 Sq. Ft.
Memberships are required to use the private golf club amenities. The Golf Club at Palmira - 36,000 Sq. Ft. There are plenty of activities available in Palmira. Here is a sample of some of the clubs, activities and classes offered here. Carriage homes consist of four units per building. They range from 1,654 to 2,297 square feet of living space. They have two or three bedrooms, two or two-and-a-half bathrooms, and an attached two-car garage. The coach homes in the community are available on a resale-only basis only and are arranged in two-level buildings with four units per building. Most homes offer two to three bedrooms, two to two-and-a-half bathrooms, and an attached two-car garage. Enclosed porches offer a place to read the paper or entertain guests. All coach home neighborhoods have private community pools and a small clubhouse. The single-family homes in the community range from smaller villas to larger estate homes. All homes offer at least two bedrooms, one to three bathrooms, and an attached two-car garage. Most have beautiful golf course views and in-ground pools enclosed in a lanai. Please Note: Floor plans are not available at this time. We've been looking at resale condos here and found a couple we love. The construction quality seems really good and the amenities are fabulous. The monthly costs are a little steep and then you have to buy a membership for the clubhouse and golf. We're highly considering this community but are concerned about the extra costs. 55places.com is not affiliated with the developer(s) or homeowners association of Palmira. The information you submit is distributed to a 55places.com Partner Agent, who is a licensed real estate agent. The information regarding Palmira has not been verified or approved by the developer or homeowners association. Please verify all information prior to purchasing. 55places.com is not responsible for any errors regarding the information displayed on this website.